The Office of Greenways and Trails (OGT) held six well-attended public workshops throughout the state in September to solicit input for updating the opportunity maps for the Florida Greenways and Trails System. The opportunity maps are the base maps used to complete the overall system of connected greenways and trails in Florida. They consist of existing, planned and conceptual non-motorized land trails and paddling trails. Even though the public workshops are finished, you can still provide input until October 23rd by contacting the appropriate regional coordinator in OGT. The Land Trails Opportunity Map comprises trail planning efforts by cities, counties, transportation planning organizations and other agencies throughout Florida, focusing on linear trails that form a comprehensive connected system. The Paddling Trails Opportunity Map represents the vision for a comprehensive water-based trails system. It includes waterways that are designated as part of the Florida Greenways and Trails System or are appropriate for future designation. These trails must be scenic, at least three miles in length, and navigable for the majority of the year. To ensure that the department uses the most accurate, current and comprehensive data for the opportunity maps, the Office of Greenways and Trails conducts reviews and updates of the maps every three years. The finalized maps will be presented to the Florida Greenways and Trails Council for approval at its December meeting. Several of Florida’s roadside attractions that were once popular tourism magnets are today’s premier state parks. To explore these delightful destinations visitors can plan an adventure using the ‘Wish You Were Here’ self-guided itinerary developed by the Florida Department of Environmental Protection’s Division of Recreation and Parks (DRP). Visitors can create their own road trip adventures traveling to state parks that were once roadside attractions existing before 1970. 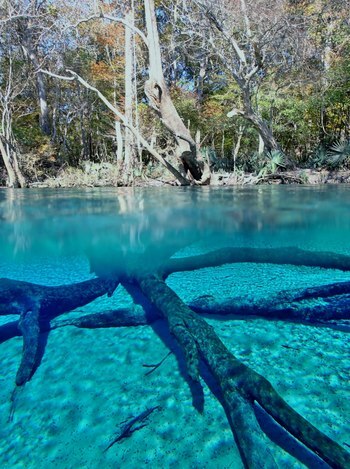 The route begins at Wakulla Springs and meanders to Silver Springs, De Leon Springs, Weeki Wachee Springs, Homosassa Springs and Rainbow Springs. DRP partnered with the University of Central Florida and University of Florida to create interpretive materials to tell the story of each former attraction. At the University of Florida, a graduate honor’s class was developed entirely around Florida State Parks to support 'Wish You Were Here'. The six state parks included in itinerary project all freature freshwater springs. Each of the six state parks will host a 'Wish You Were Here' event during fall 2015. Nov. 8, De Leon Springs State Park, 1 to 4 p.m.
Nov. 11, Edward Ball Wakulla Springs State Park, 1 to 4 p.m.
Nov. 12, Ellie Schiller Homosassa Springs Wildlife State Park, 11:30 a.m. to 3 p.m.
Nov. 21, Weeki Wachee Springs State Park, 2 to 5 p.m.
Dec. 2, Rainbow Springs State Park, 1 to 3 p.m. The Kissimmee Trail pedestrian bicycle bridge officially opened Wednesday, September 16, 2015, with a ceremony and ribbon cutting. The total structure, more than 1,100 feet in length, provides a visual gateway with signage welcoming traffic into the City of Kissimmee from the north. An emphasis was placed on green features in the design process, such as solar lighting that will reduce its environmental footprint. The bridge was planned as part of a coordinated effort between the city, Osceola and Orange counties, Florida Department of Transportation (FDOT) and MetroPlan Orlando. Construction began in December 2013 and was recently completed at a cost of $9 million, with nearly 95 percent of the funding coming from the FDOT. The 220 foot main span crosses over John Young Parkway. 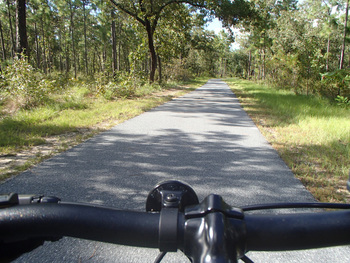 It's one of the final keys in the grand plan for the City of Kissimmee’s bicycle path system and connector to the Osceola/Orange County bicycle network and the Shingle Creek Regional Trail system. The Kissimmee Trail Bridge allows for the continuation of the Kissimmee Trail Loop, a seven-mile trail that will use off-street paths as well as sidewalks and dedicated bike lanes. The trail is about 75 percent complete, with bike lanes along central and the western section along Shingle Creek yet to be completed. That part of the trail will ultimately, as part of the Shingle Creek Regional Trail, connect to Orlando and other parts of Orange County. Currently known as the MPath, the bike path underneath the City of Miami’s Metrorail has limited lighting or amenities and needs wider and safer crosswalks. The vision of The Underline Trail addresses these pedestrian and bicycling safety issues and much more. The Underline is the brain-child of Friends of The Underline, a non-profit organization advocating to transform the underutilized land below Miami’s Metrorail into a 10-mile, 121-acre linear park. Supporters intend to create The Underline as a world class park that will connect communities, improve pedestrian and bicyclist safety, will restore natural habitats, encourage a healthy lifestyle, provide an easily accessible place to exercise and create a mobility corridor that integrates transit, car, biking and walking. The result will be a smarter, safer and less congested city. This urban trail has the potential of attracting tourists and revitalizing businesses along US 1. The Underline will include innovative public art installations by recognized national and Miami-based visual artists to enrich the public realm. To that end, the Friends of the Underline and Miami-Dade County Parks, Recreation and Open Space Department, recently partnered to receive $200,000 from the prestigious ArtPlace America ‘s 2015 National Grants Program. The Underline is a vision embraced by many in the local community including the Office of the Mayor, Miami-Dade County, homeowners associations, local museums, botanical gardens and the Netherlands’ Embassy in Miami. The Rails to Trails Conservancy is conducting a national survey of trail users to assist with trail planning and development. Take the Survey! Celebrate Greenways and Trails Month! October is Florida Greenways and Trails Month and that usually means drier, cooler days—perfect for getting outdoors! Take some time to explore a wooded path or glide down your favorite river or stretch of coastline. For paddling enthusiasts, several statewide events are scheduled. These include the 13th annual Florida Paddlers' Rendezvous along the Suwannee River October 16-18, the Paddle Florida Suwannee River Wilderness Trail trip October 22-27, and several guided day trips in Florida state parks. Also, 16 paddlers will be part of the annual Apalachicola RiverTrek October 6-11 to support the Apalachicola Riverkeeper. This year, there is another contingent bicycling along the entire Apalachicola River corridor. Bicycling events are highlighted by the Suwannee Fat Tire Festival October 23-25, and don’t forget the always fun Ride of the Living Dead cycling event on the Cross Florida Greenway October 24. There are two ride options—22 or 50 miles. Dress up in your best Halloween costume for the contest! Florida state parks are offering a variety of local trail-related events. Find an event near you! 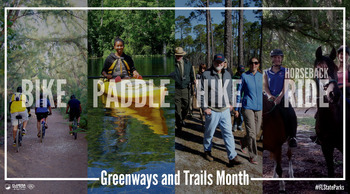 And keep checking the Florida Greenways and Trails Community Calendar for scheduled trail events throughout the year, and the online trail guide for places to go. Florida has more than 8,000 miles of land-based trails and 4,000 miles of paddling trails that provide vast benefits for Florida's economy and tourism and the health and well-being of trail users. The Shared Use Nonmotorized (SUN) Trail Network is a program with dedicated funding to implement paved trails. The trails community was excited to learn that establishing a connected paved trail system recently took a big step forward. Beginning in 2015, the Florida Department of Transportation (FDOT) will be allocated $25 million annually from new vehicle tag fees to expand the statewide network of paved trails. Expanding the state’s trail network has the potential of producing numerous economic benefits, including increasing spending at local businesses, influencing business location, revitalizing depressed areas, providing sustainable tourism opportunities and creating jobs. The SUN Trail Network is a component of the 2013-2017 Florida Greenways and Trails System (FGTS) Plan. In 2014, the FDOT was directed to give funding priority to trail projects of national, statewide or regional importance identified within the FGTS Plan, support the transportation needs of bicyclists and pedestrians, and facilitate an interconnected system of trails by completing gaps between existing trails. As FDOT or a certified contractor completes a trail's construction, another entity will operate and maintain it. The FGTS Plan is the responsibility of the Florida Department of Environmental Protection, Office of Greenways and Trails (OGT). As a basis, the agencies are using the publicly reviewed and approved 2013-2017 FGTS Plan and the Priority Land Trails network that was adopted in 2012 for the plan. The Priority Land Trails map and 2013-2017 FGTS Plan were adopted through an extensive public process and approved by the Florida Greenways and Trails Council, a group consisting of local, state, and federal land managers, a representative from the FDOT, and citizens who use trails and greenways. The process of identifying the statewide trail system begins at the local level, with hundreds of smaller potential trails of varying lengths submitted by municipal and county governments and regional planners to OGT. In December 2015, OGT will recommend approval of an update to the statewide Opportunity Map of land and paddling trail corridors to the Florida Greenways and Trails Council. Following the Opportunity Map update in 2015, then OGT will evaluate these corridors in relationship to the 2013-2017 FGTS Plan and the Priority Land Trails map. Priority Trails are not being updated in 2015, but will be updated beginning in 2017 for approval by the Florida Greenways and Trails Council as part of the 2018-2023 FGTS Plan. The new SUN Trail program is currently in development, and FDOT is in the early stages of establishing the program guidelines. FDOT and OGT are working closely during this process and expect the SUN Trail Network will closely align with the publicly reviewed Priority Land Trails. Sun Trail project review and prioritization will continue to be a public process. Funding for implementing SUN Trail provides unprecedented state support for the vision of one day traveling an established interconnected system of trails from Pensacola to Key West. The popular Holmes Creek Paddling Trail in Florida’s Panhandle has been extended on both ends of the currently designated portion. Increased from 19 to 34 miles, this stunning waterway offers a longer paddling opportunity for those who are drawn to the creek’s pristine waters and scenic beauty. Paddlers are urged to visit Holmes Creek during weekdays and the cooler months of the year to avoid the crowds and boats that fill the river on warm weekends, especially Cypress Springs. In spring and fall the arching trees explode with radiant hues while wildflowers dot the banks with splashes of color. The observant paddler will see all manner of wildlife above and below the clear waters, a window to a dynamic underwater realm. 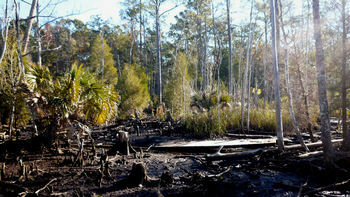 Burnt Sock Landing at the northern end of the creek, managed by the Northwest Florida Water Management District, adds an extra two miles to the top end of the trail. This recently opened public access provides ample parking and is suitable for canoes, kayaks, and small carry-in fishing boats. To explore the longer southern portion of Holmes Creek, paddle downstream from Live Oak Landing, the original endpoint of the trail. It is six miles to Shell Landing on the west side of Holmes Creek or Potter Springs Landing, a short distance further on the east side of the creek. Another 1.5 miles downstream Holmes Creek joins the majestic Choctawhatchee River. The first available public access on the Choctawhatchee River is Cedar Tree Landing, 5 miles downstream. Stay tuned for a revised on-line paddling guide and enjoy a splendid fall adventure on Holmes Creek. The Florida Trail is one of America’s eleven National Scenic Trails and, it seems, one of America’s best kept secrets. In case you are among the unaware, the 1,300-mile Florida National Scenic Trail (FNST) extends north from Big Cypress National Preserve and through the Osceola National Forest, where it turns west and heads across the Panhandle to Gulf Islands National Seashore. On its way across the Panhandle, the FNST passes through the Saint Marks National Wildlife Refuge. Within the Refuge, the Trail crosses the headwaters of Spring Creek—an area of tidal ebb and flow and, in spots, of crotch-deep black mud. With no dry land available, the worst of the muddy places were spanned by boardwalks. Ten years ago, a hurricane’s storm surge raised those boardwalks up and twisted them like corkscrews. Eventually they became too dangerous to clamber over, they were removed, and the Trail was closed—resulting in a 5.25-mile road-walk detour around this highly scenic area. The Florida Trail Association (FTA) is among the finalists in a voting contest for a grant from the American Hiking Society to replace those boardwalks and close this gap in the Trail. The two trail projects with the most votes will each win $25,000. You can help FTA win a grant by voting for the FNST every day, through the end of October. Ask your family, friends, neighbors, and club members (over age 21) to vote, and put it out on your social media (facebook, twitter, etc.) too. Vote today and vote every day!